We're pleased to offer this jewelled bookmark-which-behaves-also-as-a-most-accurate-pendulum. 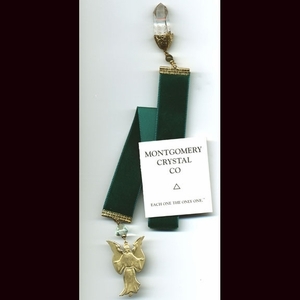 It's jade green velvet, with a remarkable, rare 8-faced rock crystal to aid your concentration. A labradorite bead with blue flash is above it, and a fancy-cut triangular fluorite [focus, concentration] bead supports the large brass angel. The velvet will not mar your books, and can be washed if you also read with chocolates, is 12" with the end bars. Overall length is 16 1/2" of sumptuous companionship - and also a great gift.